service should be used - ie: one in which packets may be sent and received without being enclosed by the connect/disconnect procedure. 2. 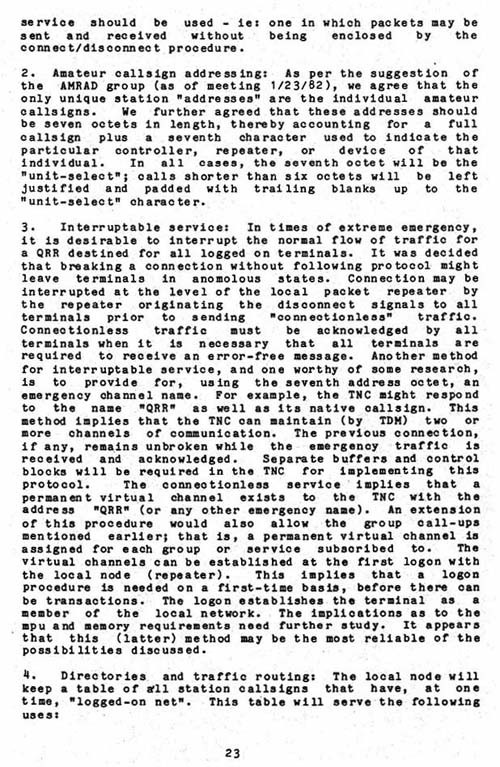 Amateur callsign addressing: As per the suggestion of the AMRAD group (as of meeting 1/23/82), we agree that the only unique station "addresses" are the individual amateur callsigns. We further agreed that these addresses should be seven octets in length, thereby accounting for a full callsign plus a seventh character used to indicate the particular controller, repeater, or device of that individual. In all cases, the seventh octet will be the "unit-select"; calls shorter than six octets will be left justified a nd padded with trailing blanks up to the "unit-select" character. 3. Interruptable service: In times of extreme emergency, it is desirable to interrupt the normal flow of traffic for a QRR destined for all logged on terminals. It was decided that breaking a connection without following protocol might leave terminals in anomolous states. Connection may be interrupted at the level of the local packet repeater by the repeater originating the disconnect signals to all terminals prior to sending "connectionless" traffic. Connectionless traffic must be acknowledged by all terminals when it is necessary that all terminals are required to receive an error-free message. Another method for interruptable service, and one worthy of some research, is to provide for, using the seventh address octet, an emergency channel name. For example, the TNC might respond to the name	IIQRR" as well as its native callsign. This method implies that the TNC can maintain (by TDM) two or more channels of communication. The previous connection, if any, remains unbroken while the emergency traffic is received and acknowledged . Separate buffers and control blocks will be required in the TNC for implementing this protocol. The connectionless service implies that a permanent virtual channel exists to the TNC	with the address	IIQRR" (or any other emergency name). An extension of this procedure would also allow the group call-ups mentioned earlier; that is, a permanent virtual channel is assigned for each group or service subscribed to. The virtual channels can be established at the first logon with the local node (repeater). This implies that a logon procedure is needed on a first-time, basis, before there can be transactions. The logon establishes the terminal as a member of the local network. The implications as to the mpu and memory requirements need further study. It appears that this (latter) method may be the most reliable of the possibilities discussed.